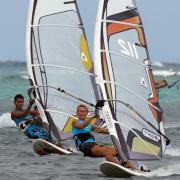 The Boracay International Funboard Cup started slowly as a windsurfing event. Kiteboarding was added in 2005, when this exciting extreme water sport grew bigger. As both sports depend completely on the wind, none of the activities harm the environment and no pollution is created. The Boracay Funboard Cup has become a benchmark for the wind sports community and other events as the Kiteboard Tour Asia were all inspired by the Boracay Funboard Cup. Tanner Aykurt is working for Funboard Center Boracay and became 2nd runner up. Congrates!